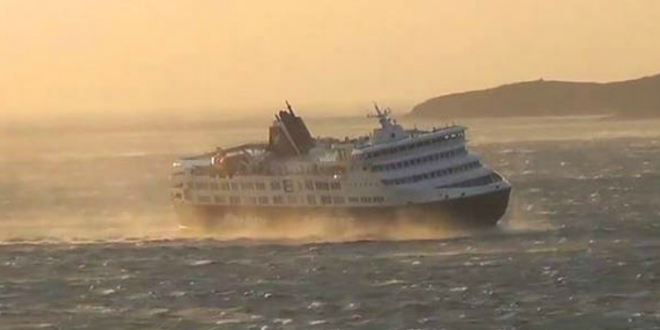 Stormy winds up to 10 and locally up to 11 Beaufort have forced authorities to order ferries to remain docked at the ports of Piraaeus, Rafina and Lavrio on Tuesday, Jan 15th 2019. Schedules to the Cyclades and the Dodecanese islands and Crete have been cancelled since early Tuesday morning. Closed to sea traffic are also the passages Nea Styra-Agia marina and Kavala-Prinos/Thasos. Sea traffic in the Saronic Gulf currently takes place without problems. Affected by the deep barometric low is especially the South and South-East Aegean Sea. Video: Passengers on deck of Elyros ferry film the rough sea outside the port of Chania on Tuesday morning. Docking at the port was possible only with the assistance of tug boats. At 10 am Tuesday, wind gusts reached 130 km/h in Finokalia/Lasithi prefecture, Crete and 108 km/h on Penteli mountain in Attica. According to meteorologists’ forecast, wind power is expected to reach 11 Beaufort in the Dodecanese. 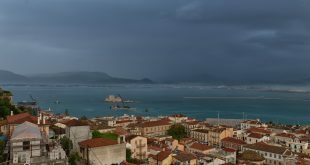 Strong rainfalls, storms and eventually hale are expected mainly in Cyclades, Dodecanese and Crete. Snowfalls also on the mountain areas in North Crete. Strong snowfalls are expected in the mountainous and semi-mountainous areas of Sterea, Evia and Peloponnese, at times also in the low lands. Snow is expected also in the North and North-West areas of Attica. Temperatures will drop in Northern Greece. The weather deterioration is expected to be of short duration. If you plan to travel by sea, ask local port authorities and travel agents.